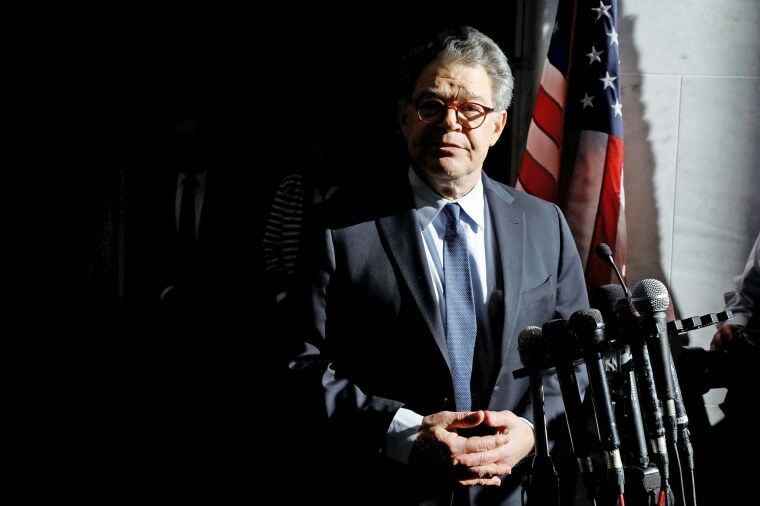 Sen. Al Franken thanked his supporters in Minnesota on Thursday in his first public appearance in his home state since he announced his plans to resign earlier this month amid accusations of sexual misconduct. "I may be leaving the Senate but I’m not giving up my voice," Franken said in Minneapolis. Franken announced last week that he planned to step down on Jan. 2. Minnesota Gov. Mark Dayton tapped Lieutenant Gov. Tina Smith as his replacement, a candidate whom Franken called "my friend" and said was "worthy of the incredible support that I've received." Franken spent much of his speech thanking his supporters, staff and family and sharing his legislative accomplishments. "Serving the people of Minnesota in the U.S. Senate has been the honor of my life," he said. "I am here tonight to say, 'Thank you.'" And yet, he said, there was still more that needed to be done. "We still have a lot of work to do together on issues ranging from net neutrality to climate change," Franken said. "We still have to be ready to speak out for economic justice and to defend the truth." One of the more emotional moments of the speech centered around the support his wife has provided him throughout his tenure in the Senate. “Whatever it is that we do next we will do it together," Franken said, beginning to choke up. "While I can never thank her enough for her love and support, I am willing to spend the rest of my life trying, honey." The former "Saturday Night Live" comedian was in the middle of his second term as the U.S. Senator from Minnesota, when he was dogged by multiple sexual harassment accusations from the past. Though the senator welcomed the Senate Ethics Committee’s plans to investigate the allegations, his fellow Democratic colleagues ultimately pressured him to give up his seat. Despite the controversy, Franken still remains popular among his Minnesota constituents. While 42 percent believe he should go through with his resignation, 50 percent believe he should remain in office and 60 percent the Senate Ethics Committee should have had an opportunity to finish its investigation, according to a Public Policy poll out Thursday. According to the poll, 57 percent of Minnesota women approve of him and only 37 percent do not. Meanwhile, President Trump’s approval numbers among women in the state sit at 40 percent while 58 percent disapprove, Public Policy reported.